Standing 117 metres above the streets of the West End, Centre Point’s Tower is an unmissable landmark and one of London’s first skyscrapers. It’s part of a wider complex which is used for retail and residential purposes. Although long since eclipsed in height by newer buildings, the Grade II listed 34 storey structure cuts an impressive architectural figure. Sought-after residential accommodation in its rejuvenated tower comes at an exclusive price. The Centre Point building comprises of a number of parts in addition to the iconic tower. SIG D&T brought its technical expertise at the base of the tower. SIG Design & Technology’s proven capabilities in providing effective roofing solutions for listed buildings meant their specification expertise was invaluable in meeting the various challenges. 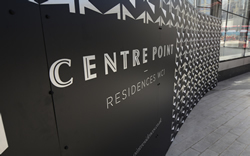 The refurbishment project saw eight separate areas at Centre Point being waterproofing to SIG D&T’s design specification. To the iconic tower itself, the aesthetic requirement from the architect and client stated that no waterproofing on the terrace areas should be visible. Having a waterproofing solution that could detail at interfaces and upstands with liquid and tight detail that was both compatible with the existing design and offered a guaranteed solution was also critical. Working with specialist sub-contractors. AC PLC, SIG advised on waterproofing for the window façades in part of the tower. The waterproofing needed to be versatile enough to work on the areas being refurbished as well as the interface with the tower’s iconic diamond shaped concrete window frames. This is where IKO’s Polimar liquid was used as the interface material, specified by SIG’s design. IKO Polimar FCS Roof Waterproofing was chosen as a highly durable system for both refurbishment and new build projects, which offers the additional benefit of rapid curing. IKO Polimar liquid is specifically designed as a highly durable system for flat roofs. Since it is applied as a liquid, IKO Polimar FCS creates a seamless waterproofing system in which even the most complex roof penetrations can be reliably and durably incorporated. It is also extremely weather-resistant, crack bridging and flexible at low temperatures. Its rapid curing property helped speed up the refurbishment process while facilitating the overall programme of works for following trades. At Centre Point Tower, existing asphalt had cracked and failed over the years, allowing for unwelcome water ingress. Water was leaking into the existing buildings down to the ground floor level and caused problems during the strip-out of the existing ground floor by main contractor Multiplex. It was only when AC waterproofing had completed the installation of the vapour control layer element of the overall waterproofing system that Multiplex were able to start the work on the ground floor. In total, the refurbishment project saw eight separate areas at Centre Point being waterproofed to SIG D&T’s design specification. The Centre Point complex has terraces both to east and west of the main tower, three storeys above the ground level, known as Centre Point East and Centre Point West. Both the Centre Point East and West terraces benefitted from the same build-up. From the top to its base, the new build-up comprised of high performance decking on top of an appropriate protection layer; IKO Ultra Prevent waterproofing; tapered insulation; IKO self-adhered vapour control layer, IKO primer and a concrete deck. The IKO Ultra Prevent System (torch on) offers the highest fire resistance without affecting the exceptional waterproofing function or life expectancy of the membranes. IKO Ultra Prevent offers the latest generation of high-performance, elastomeric reinforced bitumen roofing membranes with significant advantages over conventional polyester-based roofing membranes. IKO Ultra Prevent membranes have enhanced polyester/glass fibre, dual-laminate base fabrics for added strength and dimensional stability. A high content SBS polymer modified bitumen coating also gives an outstanding low-temperature flexibility of -25°C. Some 14 storeys above ground level, the new roof to Centre Point House was capped with ballast and paving. Below this, there was also a new build-up comprising an appropriate protective layer; IKO Ultra-Prevent waterproofing; tapered insulation; IKO self-adhered vapour control layer, IKO primer and a concrete deck. At Centre Point, water attenuation had become an issue, as the waste pipes had not been upgraded in recent years. SIG Design & Technology specified a build-up which will contribute to a sustainable urban drainage system (SUDS) including two green roofs, in order to slow down the release of surface water run-off. Both green roofs were installed adjacent to each other on the south side of Centre Point House. The first green roof, approximately 400 metres² in size, is a Sedum vaulted green roof. The build-up to the green roof comprises an appropriate drainage layer; IKO Ultra-Prevent waterproofing; SIG tapered insulation; IKO self-adhered vapour control layer; and IKO primer over a concrete deck. The second green roof, approximately 100 metres in size, is flat in profile and biodiverse. Although smaller than its sister vaulted green roof, its build-up mirrors that of the larger roof. The specification chosen supplied this structure as a flat roof to reduce the amount of run off, rather than being the usual slightly vaulted green roof. Ross Finnie, Sales Director at SIG D&T, commented: “Once again, SIG D&T has demonstrated innovative thinking, this time on a prestigious project at one of London West End’s prominent landmark buildings. “Not only did the waterproofing systems we specified need to be versatile and work with different areas of the Centre Point building envelope but meeting aesthetic demands at this Grade II Listed building was also an important element of the client brief.